Creating natural landscapes for play, learning and relaxation. Woodland Escape designs beautiful, natural spaces to enhance play, creativity and relaxation. At Woodland Escape we believe play spaces should be creative, adaptable, child-centered and fun. We pride ourselves on working with you and your community to create a space that is unique to your needs and represents your community's ideas. We use natural materials wherever possible, add in loose parts to enhance children’s play and create spaces to promote children’s connection to nature. Whether it's supporting you with a large project or assisting as you get started with a smaller one, Woodland Escape can work with your school community to create outdoor-learning spaces that provide opportunities for children to play creatively and collaboratively, explore STEAM concepts, challenge themselves physically and foster a sense of environmental stewardship. We can help you create a garden that is functional, useful and relaxing. Whether it's helping you with a specific project - like creating a vegetable garden, assisting with maintenance or designing and managing a garden makeover, Woodland Escape can help you turn your garden into a space you'll love to be in. Emma is deeply committed to healthy play and a connection with the natural world for all children. She is very knowledgable and is easy to work with. In addition to delivering an initial design, based on input from our community, Emma has been a resource moving forward, suggesting reading and where to source the right plants! I appreciate Emma’s dedication and love of what she does- her passion shows through! I highly recommend working with Emma to help you create amazing play and natural spaces for your tamariki. 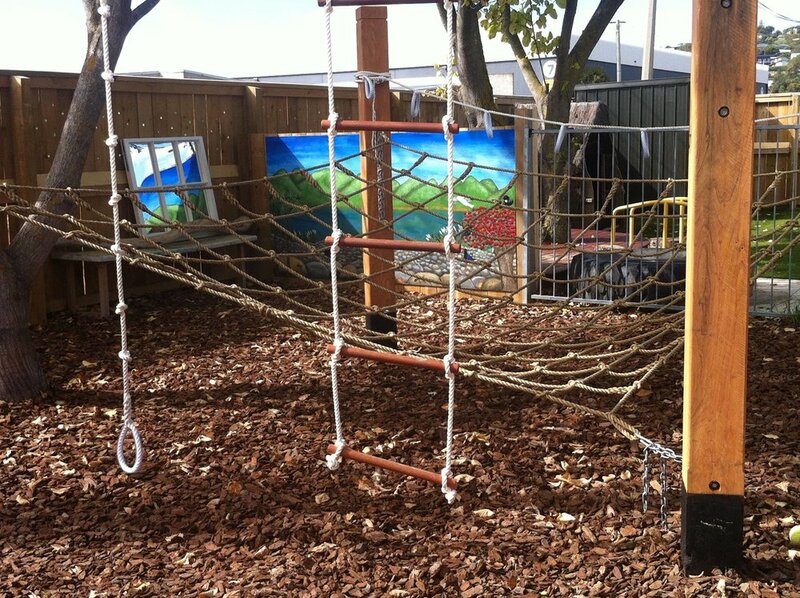 Ferrymead Preschool were interested in bringing more natural materials into their space and more opportunities for their older children to swing, climb, hang, work on their upper body strength. They also wanted to establish more of a connection to the estuary which they back onto and visit regularly with their children. As the space isn't large, they wanted to stay away from a more traditional swing set, which would take up too much room, but still wanted to provide lots of opportunities for children to experience the sensation of swinging. We put posts in which allows for the teachers to change the space, putting in cargo nets, ropes, rope ladders and other equipment in a variety of different ways. We added a water play area next to the sandpit using local rock and shell. The children can divert the water to create different pools and channels. The addition of a large deck around the existing tree and a circle of tree stumps gives space for quieter play or for jumping and balancing. The teachers noted how the children's play had changed and how they quickly adapted to the changes in the environment. They observed that the addition of a ramp and steps from the deck encouraged younger children to practice new skills and improved their coordination and confidence navigating uneven surfaces. 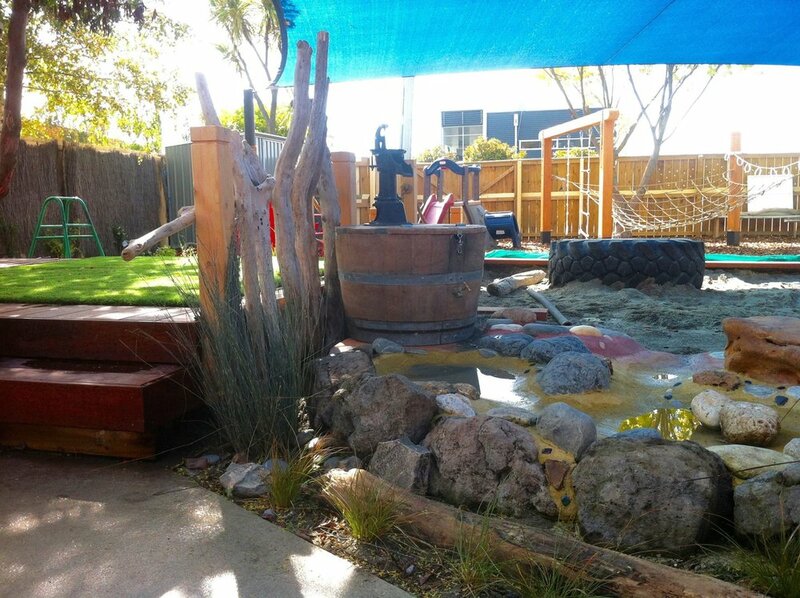 Prebbleton Playcentre was keen on bringing more natural materials into their playground, adding a water play area, a bridge and replacing their hut, which had been damaged recently. Working closely with Rob from NatureFlow, we created an space which would cater for all ages and provide a space for exploring different textures, surfaces and materials. The project culminated with one of my favourite ways to work - a working bee for planting, mulching and more! The Playcentre community chipped in for a morning of finishing the space and celebrating with a bit of food, conversation and play. From conception to completion Emma was the guide we needed to develop our outdoor area at Prebbleton Playcentre. Working with a group is hard, lots of ideas and not necessarily a lot of expertise which is where Emma was our greatest support. She was able to bring together all our vague ideas by listening to our collective ideas and creating a design that was perfect for us. From advising us around size, type, durability of which plants to choose and why, ground prep, covering and space awareness. – her support to shop for plants and to further deliver much of the materials needed to plant. She is the hardest, steadiest worker from digging holes for sumps and co-coordinating and working alongside parents and children on the working bee. Emma has listened to our ideas, concerns and has always respected our input and looked to incorporate as much as possible. In March, 2018 I created two pop-up playgrounds, one in the central city and one in the residential suburb of Woolston. These installations lasted for two weeks and were incredibly popular - showing that there are many people in Christchurch interested in spaces that cater for this type of play. At the city site, we put in sand and a soil pits and lots of natural and recycled loose parts. Children used the materials to make mud pies, obstacle course, huts and more. It was exciting to see how well the space was used! Loved the feedback from community. The Woolston pop-up was set at Thistledown reserve, next to a gorgeous natural area that community volunteers maintain. The Woolston space was created in conjunction with Christchurch City Council for Parks week. It seemed to attract more older children, who were perhaps playing by themselves after school - which was fantastic to see. The huts had 'fort' like qualities and were elaborate and changed everytime I went. I loved the idea that neighbourhood children had a space with materials they could use however they wanted and create their own space for play. Read more about the pop-up here.